Even though I'm not big on soup, I enjoyed my first bowl of it tonight. I used half chicken broth & half water, because I don't like strong broth. 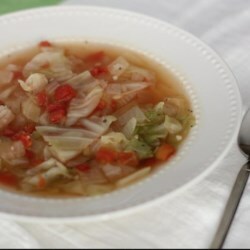 Also used a whole onion & whole cabbage, & plain stewed tomatoes; added Italian seasoning & omitted salt. If I do it again I would use fresh plum tomatoes in place of canned, because I prefer to stay with whole foods & avoid added sugar, salt, high fructose corn syrup, etc. This is definitely a nice way to use cabbage. Will probably do this one again. I gave it a 4 because of the use of convenience ingredients which are not healthy.